One of my goals in the past few months was to finish up our hallway makeover. I definitely had to look to Pinterest for inspiration. 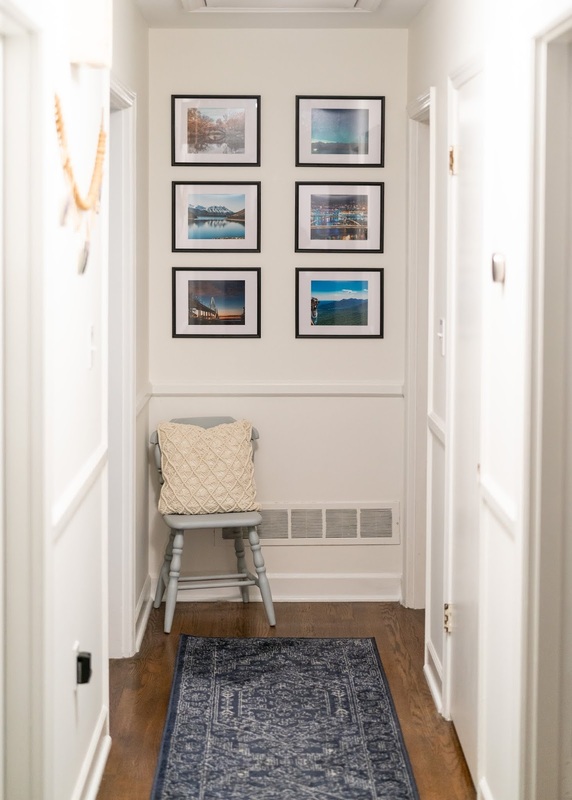 I found the majority of my inspiration from this hallway makeover, and I think it turned out pretty similarly! Our hallway is typical of an old brick ranch in that it's quite narrow. All of the bedrooms & bathrooms in our house are located down this hallway, so it's mostly broken up by a lot of doors. If you're sitting in our den (where we spend the majority of our time), you can see a portion of the hallway, and I knew I wanted that spot to be decorated in a way that's simple but eye-catching. I also knew I had to be careful as far as decor went because it would be really easy to overdo it in such a small space. 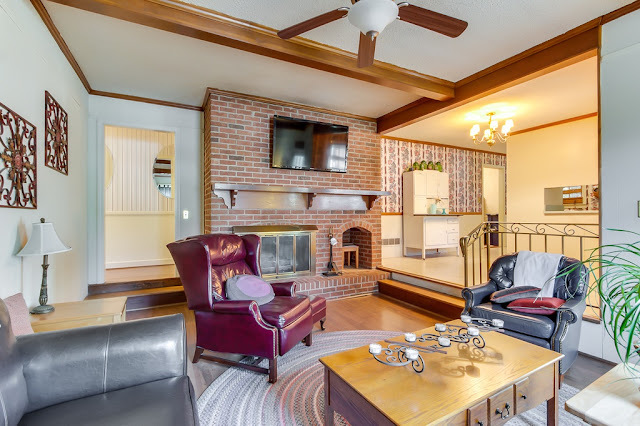 Unfortunately, I don't have any super great "before" photos, but I went back through the photos that were posted when they listed our house on the market, and you can definitely get an idea of what it looked like through the doorway in the photo from the previous owner below. It was basically wallpapered on the top half and painted a cream color on the bottom half. 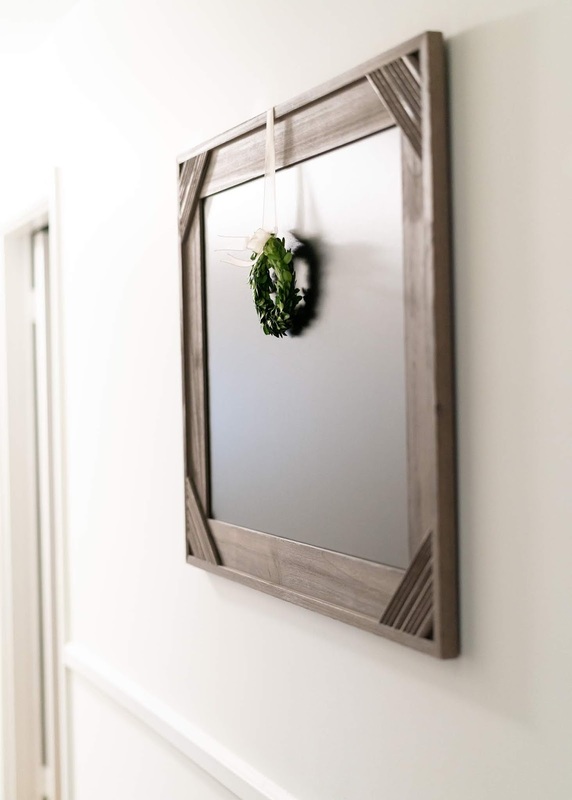 They had two large oval mirrors in the hallway, and that was about the only decor they had. Throw in a very outdated light fixture, and you have a small space in desperate need of an update. First things first... the light fixture. It was U-G-L-Y. I opted for this $32 frosted schoolhouse light fixture from Amazon, and I'm quite pleased with how it turned out. 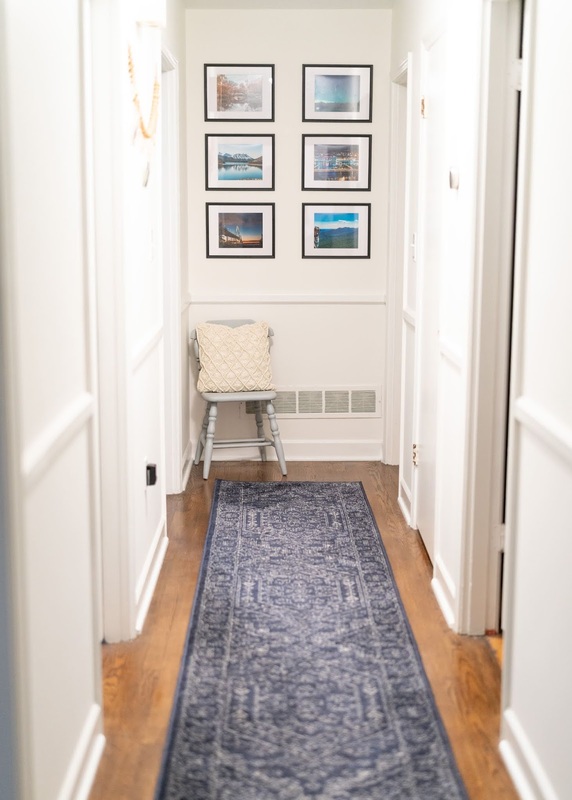 I wanted to bring some life back to the otherwise very neutral hallway with my runner rug. We have a lot of navy and other blue tones throughout our house, so this affordable navy patterned rug is perfect. I wanted to display my husband's landscape photography somewhere in our house, and I decided that the end of our hallway was the perfect spot. 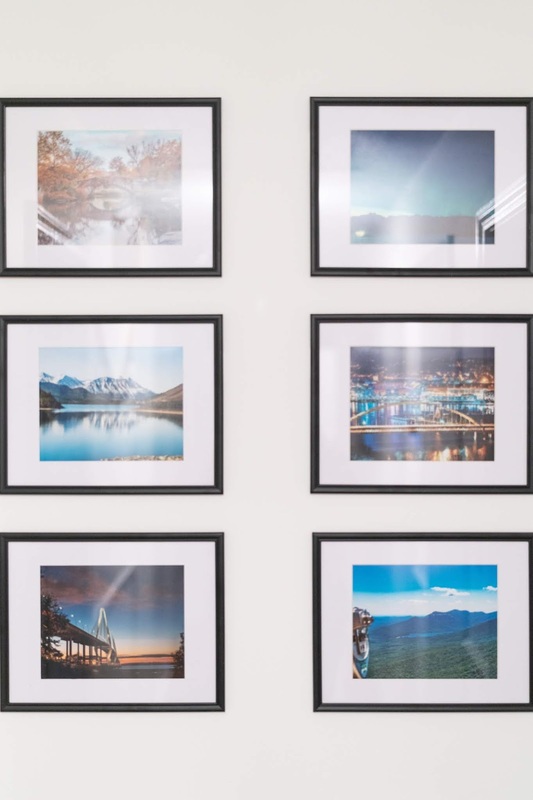 I did this gallery wall by purchasing 6 black frames from the dollar tree for (you guessed it) just $1! I ordered matting off of Amazon, and I couldn't be happier with how this turned out! It looks a lot more expensive than it actually was! 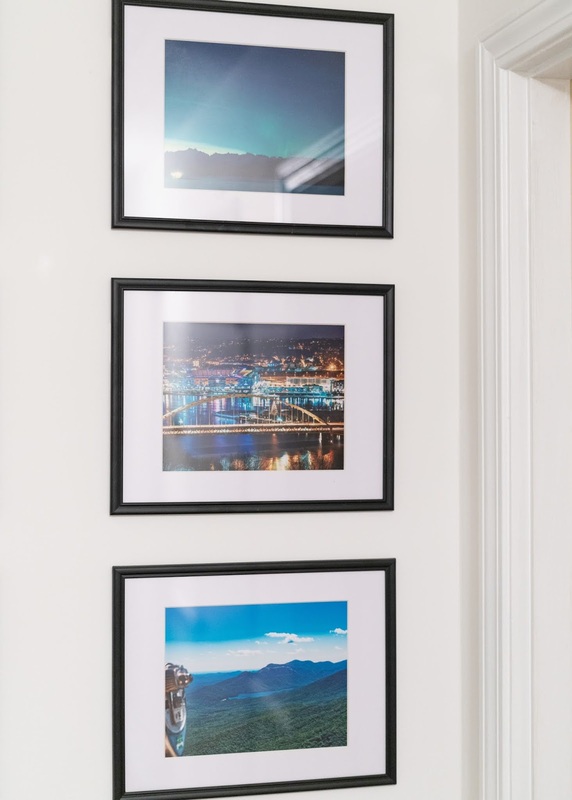 I just framed various photographs that Kyle has taken of places we've been. It's a really special spot, and I'm glad it's in a place we pass by so often! I knew I wanted a large chalkboard in our hallway, so I picked this one up from Hobby Lobby and it does the trick! 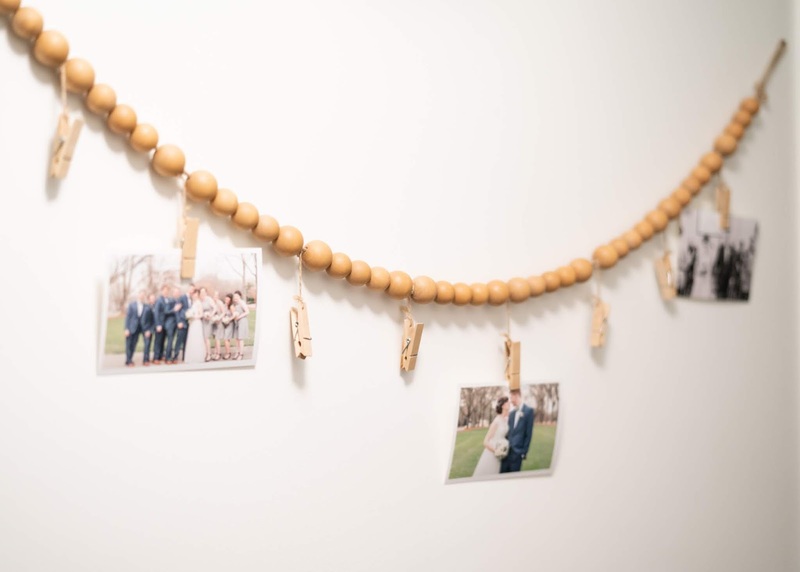 Speaking of Hobby Lobby, I also got this wood bead photo garland (only $10 right now!) from there as well. I added some photos that I already had printed out from our wedding. Lastly, I picked up a chair at Goodwill for a few dollars and spray painted it this blue/grey color. 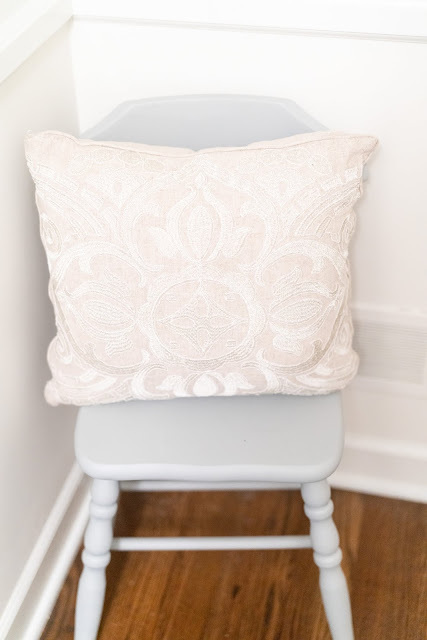 I rotate out the pillows I keep on this chair, but this one from Goodwill is so cute in this corner. There you have it - our first home update is way long overdue. 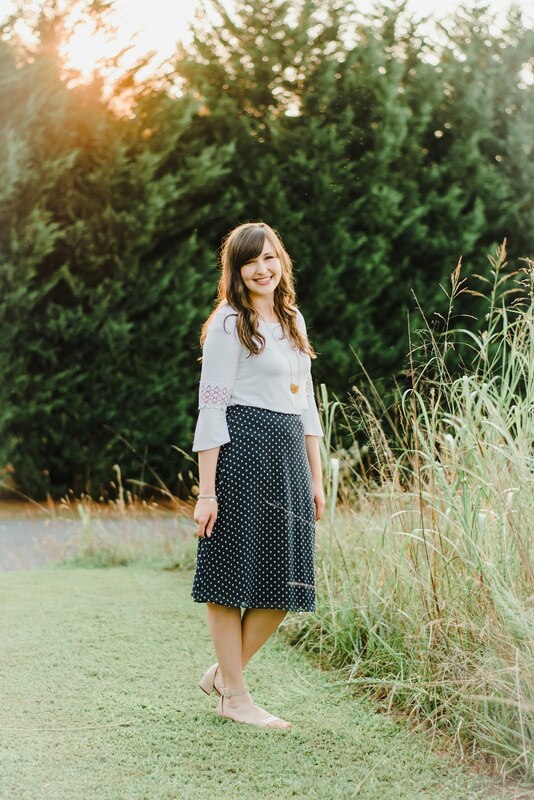 I can't wait to share more, and I hope you'll let me know what you think! This is definitely my kind of decorating and it looks lovely!